Back in October 1992, Cloughie welcomed his former team Middlesbrough to the City Ground for the final time in a league game before he retired from management. It was a midweek Premier League match between his Nottingham Forest side and the visiting Boro. "It's always a pleasure for me to be welcoming my old club Middlesbrough," he wrote in the match programme. "Blow me, it's not that long ago that they were in serious danger of going out of business. I remember being offered the chance to sign Gary Pallister for £50,000 - things had got that bad for them." Clough said he was pleased Boro had battled on despite the financial problems and had won promotion at the end of the previous season. "What they did in the process was put a smile or two on people's faces in an area of the country that has taken the full brunt of the recession." In is programme notes, Clough also praised the Forest fans for their support despite some disappointing results for the Reds. "I can't tell you how much your support has meant to me and the players this season when things have not been going our way," he said. On this occasion, Forest beat Middlesbrough, then managed by Lennie Lawrence, 1-0 with a goal by Kingsley Black. The two sides met again that season in the FA Cup, with Forest winning a replay 3-0 after a 1-1 draw at the City Ground. Back in October 1977, Clough's Forest welcomed Boro to the City Ground for a Division One game. They beat the visitors 4-0 on their way to winning the League Championship. The goals included a stunning effort from defender Viv Anderson, who scored twice that day. Almost a year later, Boro travelled to Nottingham again and drew 2-2. 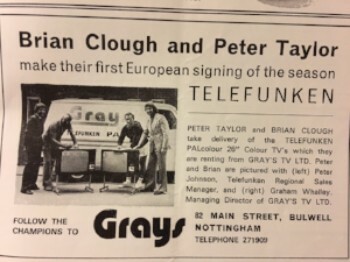 The match programme featured a photograph of Brian Clough and Peter Taylor taking delivery of two new televisions - long before the days of flat-screens! 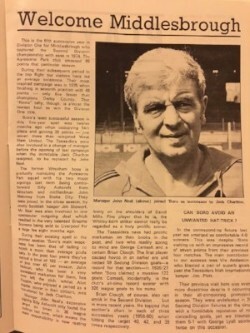 Also in the match programme was a profile on the visiting Boro team, who were managed by John Neal. It was their fifth successive year in Division One after securing the Second Division title in 1974. 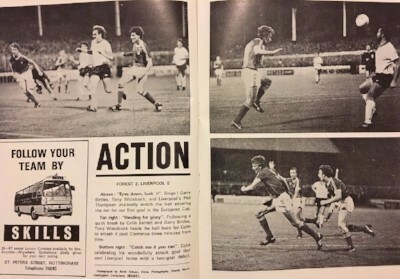 There were also photographs of Forest's memorable 2-0 win over Liverpool in the first round (first leg) of the European Cup just ten days before. As a Middlesbrough player, Cloughie scored his first hat-trick for his home-town club against Nottingham Forest at the City Ground. The visitors won 4-0 in November 1956. The match programme had highlighted Clough's potential impact. It said: 'Defintely one of Boro's young players to keep an eye on for the future.' That game is featured in the book 'Brian Clough Fifty Defining Fixtures' published by Amberley and available at a discount price on this website. Brian went on to set an outstanding goalscoring record at Middlesbrough. In 1959 it was reported that Nottingham Forest were interested in signing Clough from Boro. Of course nothing materialised at the time. Cloughie later reflected: "It was an interesting possibility but Forest couldn't have afforded my wages." Instead, the Reds waited another 16 years for the man who eventually turned their dreams into reality.